In the half year through June 30, 2018, three U.S. ETF issuers—BlackRock, Vanguard, and Charles Schwab—captured 81% of all net U.S. ETF inflows. These three firms’ asset-weighted average ETF expense ratio was a mere 0.16%. Lest you think that ETF issuers can count on charging even that, consider that two of those three issuers—the ones that grew their market share—charge their clients much less than 0.16%, on average. BlackRock, with 39% of ETF assets at the beginning of the year, drew only 36% of the net ETF flows, resulting in a drop in market share. Vanguard captured 32% on a base of 25% of the starting AUM. But the stunner here was Charles Schwab, which attracted 13% of the flows despite controlling only 3% of the assets at the outset. Vanguard ETFs now cost 0.07% on an asset-weighted average basis; Schwab’s cost 0.09%. BlackRock’s 0.22% wasn’t particularly competitive. No wonder asset managers are finding it harder and harder to make a buck these days. Fee compression is happening everywhere. Investors are all but demanding free access to portfolio management. 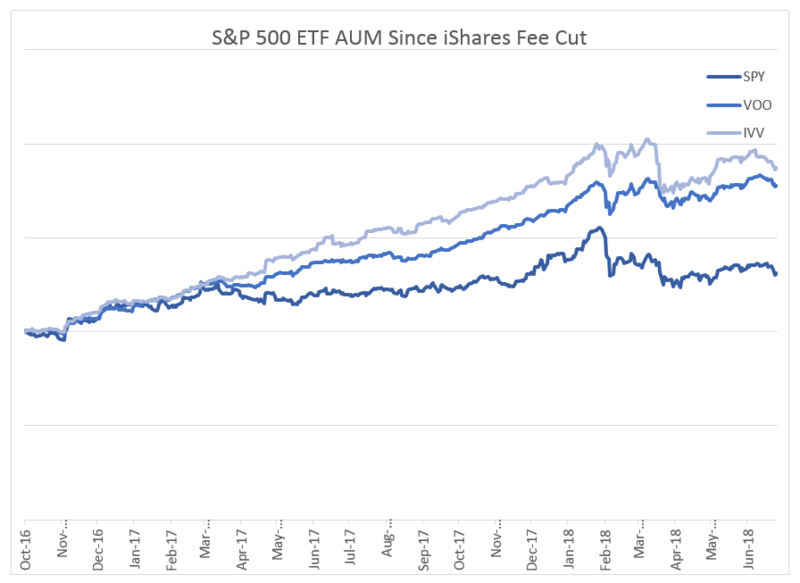 Low fees are drawing assets from mutual funds to ETFs, from active management to passive, and towards ever-cheaper ETFs. ETFs that once held market share by offering unmatched liquidity are now losing ground to cheaper equivalents. Once again, in the first half of 2018, assets fled equity mutual funds. According to the Investment Company Institute's estimates, equity mutual funds lost $47.57 billion in investor assets between January and June. During that same span, equity ETFs raked in $70.67 billion, per FactSet ETF Flows data. 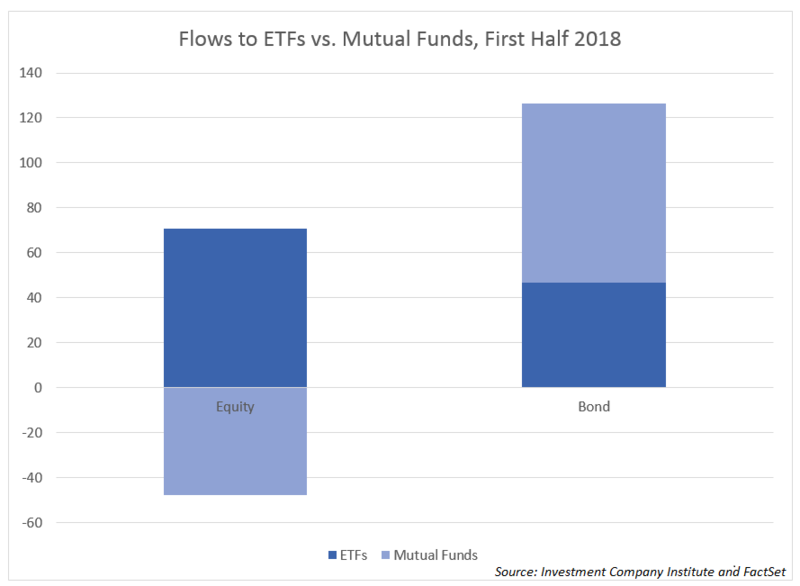 While both bond mutual funds and ETFs saw positive inflows, bond ETFs pulled well above their weight, capturing 3/8 of the bond fund flows, on a base of only 1/8 total bond fund assets. Fees explain a lot here, both within the mutual fund space and also between mutual funds and ETFs. As of the end of 2017, equity mutual funds charged an asset-weighted 0.59%. Equity ETFs charged just 0.21% at that time (excluding geared funds). Bond mutual funds cost 0.48% on an asset-weighted basis, while bond ETFs cost just 0.19%. No wonder dollars are leaving mutual funds for ETFs. Within the mutual fund space, assets are migrating to low-cost index funds. The ICI 2018 Fact Book data tables show $285 billion flowing out of actively managed equity mutual funds in 2017, while equity index funds gained $125 billion. Since 2008, active equity mutual funds have lost $1.55 trillion, while index equity funds have gained $728 billion. During that time, fund costs have fallen even more precipitously for equity index mutual funds compared to actively managed ones. Per the ICI data tables, in 2008, index mutual funds charged 19% of the actively-managed cost, on an asset-weighted basis, or 0.18% compared to 0.94%. By the end of 2017, index mutual funds had cut charges in half, to 0.09%, while actively managed equity funds had trimmed fees by only 17%. Index equity mutual funds now cost 0.09% per year, while active management runs 0.78%, both on an asset-weighted basis. Mutual fund assets are rapidly migrating to the lowest-cost options. The chart below shows the fee difference over time. The diameter of the circles shows the size of index mutual fund fees in relation to active management fees for U.S.-domiciled equity mutual funds. 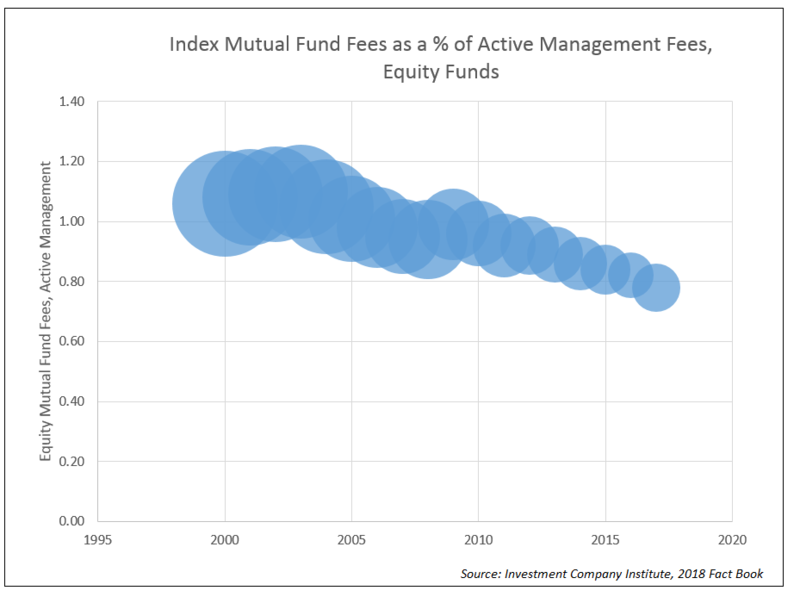 While index mutual funds have seen impressive growth, the ETF space has become ground zero for the fee war. Headline fee cuts have slowed down, but investor dollars continue to migrate to the lowest-cost options. 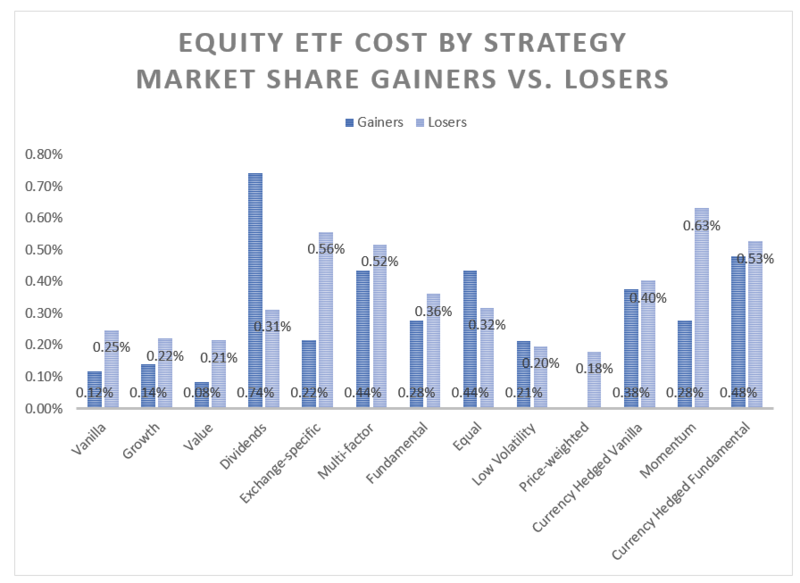 Between January and June 2018, in the U.S. ETF marketplace, ETFs gaining market share within their segments cost 0.19% on an asset-weighted basis; market share losers cost 0.27%. Actually, the market share gainers cost 0.1903%, down from 0.1912% at the end of 2017, as investors continue to favor rock-bottom costs. Equity ETFs are even more competitive than the overall ETF marketplace. Equity ETFs (non-geared) gaining market share cost just 0.17% on a weighted average basis. Those losing market share cost 0.27%, still far cheaper than those that shuttered, which cost 0.88%. Investors were willing to pay up for alternatives, and also for short-term-use geared funds, but that’s about it. Every other asset class followed the same pattern: market share gainers cost several basis points less than the loser, which, in turn, cost less than the closures. Every basis point in expense ratio increases the risk of irrelevance or failure, unless there is no competition in that particular space. Funds that once found success by opening a market niche find themselves facing competitors. That’s exactly what happened to ROBO Global Robotics and Automation Index ETF (ROBO-US). ROBO had the robotics space to itself when it launched in October, 2013. That gave it license to charge 0.95% per year. By 2016, Global X introduced a competitor, ticker BOTZ, charging 0.68%. Flows to BOTZ have since eclipsed ROBO’s. BOTZ gained $1.03 billion in new investment this half year; ROBO drew just $250.9 million. Is it any wonder that First Trust and BlackRock got into the robotics game this year? iShares Robotics and Artificial Intelligence ETF (IRBO-US), launched on June 26, 2018, costs 0.47%, literally half the price of ROBO. That’s fee compression at work. In some market segments, the competition is even fiercer. Of the three ETFs offering exposure to the S&P 500, SPDR S&P %00 ETF Trust (SPY-US) has seen massive outflows, while its cheaper-by-half competitors iShares Core S&P 500 (IVV-US) and Vanguard S&P 500 ETF (VOO-US) captured additional market share. In the chart below, the circle diameter corresponds to the ETF’s expense ratio. Bigger means more expensive. Yes, you read that right. SPY lost $21.26 billion in assets during the first half of 2018. The S&P 500 hasn’t suddenly fallen out of fashion. IVV and VOO jointly brought in $10.46 billion during that same time. 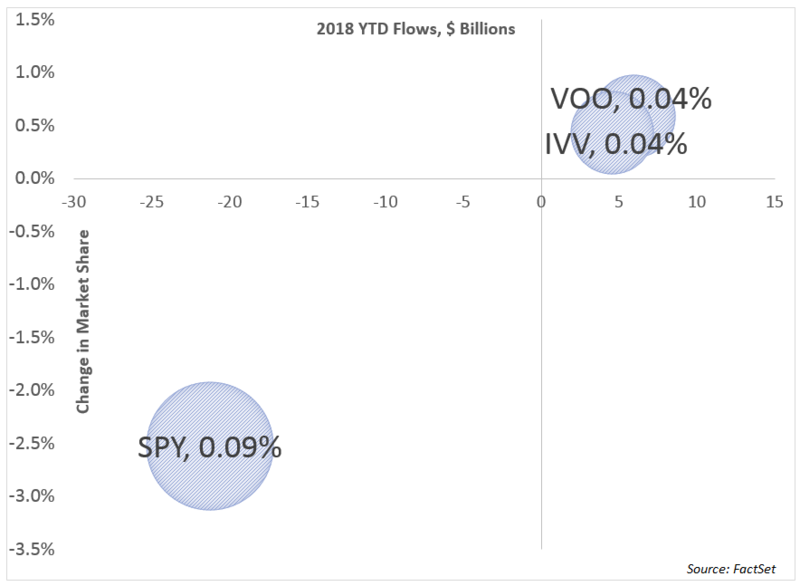 While SPY does absorb lots of market sentiment, 2018 has seen pretty steady SPY outflows. SPY’s massive trading volume no longer overcomes its price tag. SPY has been lagging IVV and VOO in asset gathering ever since iShares dropped IVV’s fee from 0.07% to 0.04% in October, 2016. What’s new is the extent of the gap. Since February’s equity market sell-off, IVV’s asset level has risen, yet SPY’s has barely budged. It is now clear that price matters most. 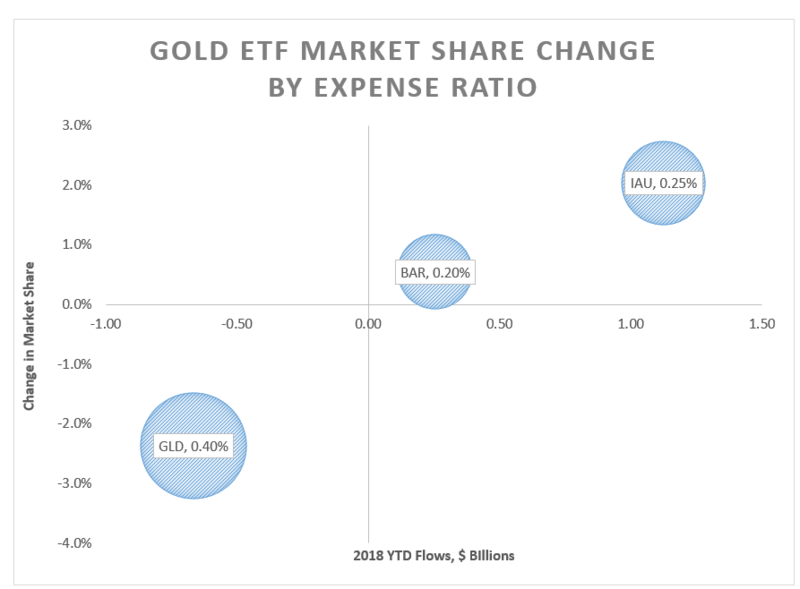 Also dethroned is longtime liquidity leader SPDR Gold Trust (GLD-US), in favor of identical exposure in iShares Gold Trust (IAU-US) and GraniteShares Gold Trust (BAR-US), as depicted in the chart below. Again, the size of the circle corresponds to the ETF’s expense ratio. The S&P 500 and physical gold funds are not the only ETFs going head-to-head on costs for identical (or nearly so) exposure. Take a look at the table to see the migration from legacy liquidity leaders like iShares MSCI EAFE ETF (EFA-US) and iShares MSCI Emerging Markets ETF (EEM-US) to their cheaper counterparts. Bond investors went for savings of a single basis point in choosing between Vanguard’s BND and SSGA’s SPAB. While this choice may have been driven by TD Ameritrade’s shift from Vanguard to SSGA, it’s still notable. No such shift drove the exodus from iShares MBB to Vanguard’s VMBS – just a 0.02% savings. The day has arrived when ETF liquidity counts less than cost. It’s fair to comment that almost all of the funds shown above are plain vanilla. Those hanging their hopes on finding investors willing to pay extra for a more complex exposure might think that they have some wiggle room in terms of fees. Yes, but also no. 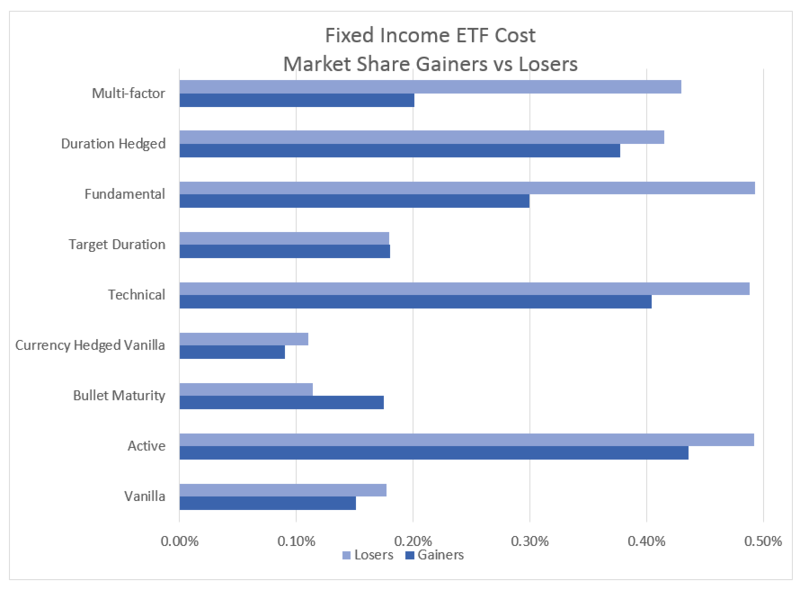 While many of the newer strategies (new to the ETF world, that is) charge multiples of what their vanilla competitors do, nearly all are facing the same cost pressures. 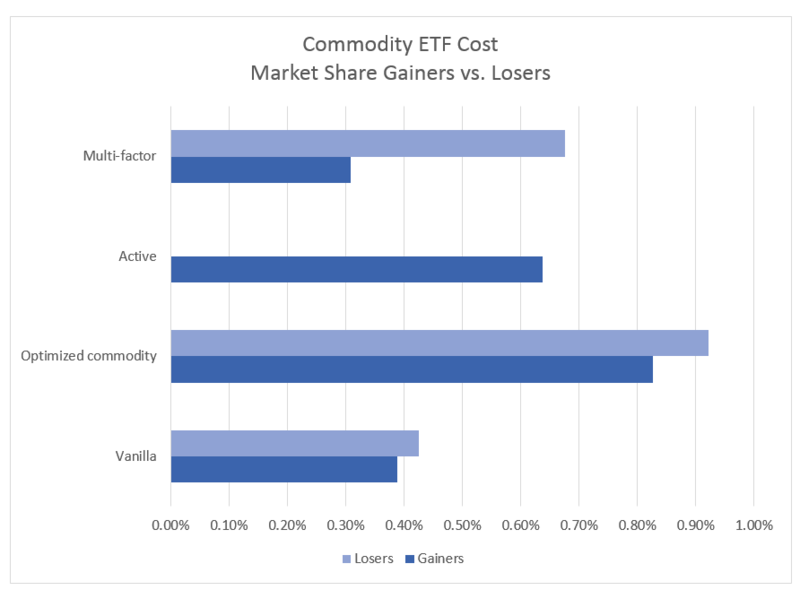 Moreover, old-school factor funds offering exposure to value and growth are now on a par with their vanilla counterparts, with market share winners costing 0.08% and 0.14%, respectively. Fundamental funds now need to charge an asset-weighted 0.28% to attract new capital. Momentum funds saw a huge gap in flows to cheap vs. expensive funds, with winners averaging 0.28% to the losers’ 0.63%. The $3.55 billion that 0.15% price tag iShares Edge MSCI U.S.A Momentum Factor ETF attracted goes a long way to explaining this. While MTUM’s breakthrough to the top 10 inflows table is big news in a space that has long been dominated by plain vanilla exposure, it cannot be taken as evidence that complex strategies will deliver high fee revenues to the asset managers. Fee compression is at work here, too. Here is how the battle for market share played out in the largest equity strategies—those that ended June with $10 billion or more in assets. And here’s how it looked in fixed income and commodity strategies that ended June with $1 billion or more. So far in 2018, as in 2017 and 2016, investors have been rewarding asset managers who offer rock-bottom costs, and punishing those who charge a premium. This trend plays out in the mutual fund and ETF world, and has shown no sign of letting up. There is every reason to expect that expense ratios will be driven to zero, or at least to the marginal operating cost. For those operators who cannot turn a profit charging 0.20%, 0.15%, 0.10%, or 0.05%, the next few years could be brutal. For now, investors have the upper hand, and show no sign of relinquishing it.